As part of CLAS’ Black History Month workshop series, we are thrilled to offer a Spring 2016 workshop featuring the award-winning film They Are We (2014) and presentations by the film’s director, Emma Christopher, and Vanderbilt historian Jane Landers. The film focuses on members of the Gangá-Longobá, a small Afro-Cuban ethnic group, and how they have kept their unique heritage alive. This moving documentary captures this community’s journey to learning about and becoming acquainted with their ancestors in Sierra Leone, West Africa, and vice-versa. Participants in the workshop will attend a screening of the film, followed by a presentation by Christopher, an academic historian, writer, and anti-slavery activist from the University of Sydney, about Afro-Cuban identity and experience. 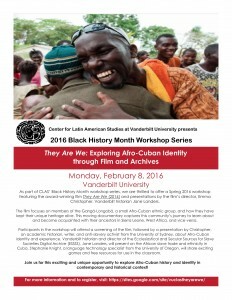 Vanderbilt historian and director of the Ecclesiastical and Secular Sources for Slave Societies Digital Archive (ESSSS), Jane Landers, will present on the African slave trade and ethnicity in Cuba. Stephanie Knight, a language technology specialist from the University of Oregon, will share exciting games and free resources for use in the classroom. 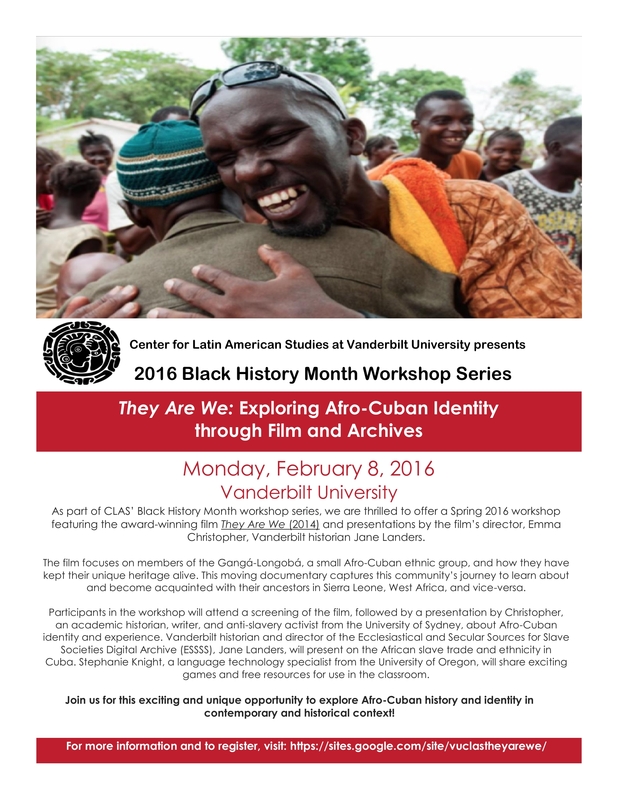 Join us for this exciting and unique opportunity to explore Afro-Cuban history and identity in contemporary and historical context! Emma is an academic historian, writer and anti-slavery campaigner who is on the faculty at the University of Sydney and currently holds a five-year Australian Research Council Fellowship. She has previously held fellowships at Yale University and Monash University, and has worked extensively in West Africa. Her first book, Slave Ship Sailors and their Captive Cargoes, was hailed as “the most important book on the Atlantic slave trade in a very long time”; her second book, A Merciless Place, jointly won the Ernest Scott prize for best book in Australian history and won the Kay Daniels prize for best book in Australian colonial history. Her new book, The Devils at Hotel Africa, about a slave ‘factory’ at Cape Mesurado, Liberia, is coming soon. They Are We is her first film. Jane Landers is an historian of Colonial Latin America and the Atlantic World specializing in the history of Africans and their descendants in those worlds. She is the author of Atlantic Creoles in the Age of Revolutions (Cambridge, Mass., 2010) which was awarded the Rembert Patrick Book Award and honorary mention for the Conference on Latin American History’s 2011 Bolton Johnson Prize for the best English-language book on any aspect of Latin American History. Her first monograph Black Society in Spanish Florida(Urbana, 1999, 2001, 2002, 2005) was awarded the Frances B. Simkins Prize for Distinguished First Book in Southern History and was a CHOICE Outstanding Academic Title. Landers co-authored the college textbook, The Atlantic World: A History, 1400-1888 (Harlan Davidson, 2007) and edited Colonial Plantations and Economy in Florida (Gainesville, 2000, 2001) and Against the Odds: Free Blacks in the Slave Societies of the Americas(London, 1996). She also co-edited Slaves, Subjects and Subversives: Blacks in Colonial Latin America (Albuquerque, 2006), and The African American Heritage of Florida (Gainesville, 1995) which won the Rembert Patrick Book Award and a commendation from the American Society for State and Local History. Landers’ 2015 Nathan I. Huggins Lectures “A View from the Other Side: The Saint Domingue Revolution through Spanish Sources,” delivered at the Hutchins Center for African & African American Research, Harvard University, will be her next publication. Link to first lecture here. Link to second lecture here. Link to third lecture here. She has published essays in The American Historical Review, Slavery and Abolition, The New West Indian Guide, The Americas, Colonial Latin American Historical Review, The Journal of African American History and a variety of anthologies and edited volumes. Landers was awarded fellowships from the John Simon Guggenheim Memorial Foundation and the American Council for Learned Societies for her current project, “African Kingdoms, Black Republics and Free Black Towns across the Iberian Atlantic.” Her research has also been supported by grants from the National Endowment for the Humanities, the Andrew W. Mellon Foundation, the Conference on Latin American History, Vanderbilt University, the Gilder Lehrman Center for the Study of Slavery, Resistance and Abolition, the Historic St. Augustine Research Institute, and the Program for Cultural Cooperation between Spain’s Ministry of Culture and United States’ Universities. Landers directs the Ecclesiastical and Secular Sources for Slave Societies Digital Archive (ESSSS) hosted by the Jean and Alexander Heard Library at Vanderbilt which is preserving endangered ecclesiastical and secular documents related to slavery in the Americas. http://www.vanderbilt.edu/esss/index.php With grants from the National Endowment for the Humanities, the British Library Endangered Archives Programme, and the Diocese of St. Augustine, Landers and her international teams have preserved records in Cuba, Brazil, Colombia and Florida, the oldest dating from the 16th century. Stephanie Knight holds an M.A. in Latin American studies from the University of New Mexico, where she served as the supervisor for Spanish 101 teaching assistants. After leaving New Mexico, she spent six years teaching high school and college courses in Spanish and spent four years serving as International Baccalaureate Diploma Program Coordinator at Hillsboro High School in Nashville, Tennessee. Her experience in pedagogy and teacher leadership is diverse. Not only has she taught grades 5-16, but she also served as diploma program caucus chair for the Tennessee International Baccalaureate Association and on the teacher advisory board for the Vanderbilt University Center for Latin American Studies. Stephanie is experienced in leading professional development opportunities centered on best practices for planning, instruction, and assessment. She has also presented at national and international conferences on the blending of two simultaneous initiatives, creating experiential learning experiences for students, and increasing access for under-represented populations of students in college-level courses.